Composer and arranger Django Bates brings his twisting jazz aesthetic to classic Beatles material in this well-worked yet curiously unadventurous reworking of the summer of love’s classic album. Bates has been commissioned by the Frankfurt Radio Big Band and partners from Sweden, Norway and Finland to reimagine the Fab Four’s most iconic collection. He clearly has a close relationship with the original material, describing in the liner notes how he bought the album at the time for his elder sister’s 18th birthday. Having always resisted invitations to arrange anything by the Beatles, he accepted this invitation in a spirit of ‘freedom, not licence’, in keeping with the unconventional schooling he himself received. Working with guitarist Stuart Hall and Danish trio Eggs Laid By Tigers, who provide vocals and a rock rhythm section, Bates examined Sgt Pepper on a bar-by-bar basis before producing this new orchestration. He made the decision to hold to the original keys and structures (including vocals), on the grounds that millions have grown up with them in some possible kind of common memory. This is a fundamental and, to me, rather curious decision. While it undoubtedly holds true to the original, it means that the innovations are necessarily restricted to backing textures, fills, occasional short solo passages and the like. The effect is of listening to music sounding, at first hearing, to be almost a pastiche of the original. Of course, Bates has a fertile imagination and a huge talent, and there is a great deal to enjoy about his work. The opening title track immediately produces time-bending quirkiness between the lines with very fine playing from the big band, while the music-hall character of songs like For The Benefit of Mr Kite and When I’m Sixty Four offer rich possibilities for squirling harmonies and woodwind – the latter track in particular featuring some great clarinet work. Fixing A Hole has some delicious harmonic twists, and She’s Leaving Home gains a cinematic feel which only expands the unbearable poignancy of the original song. 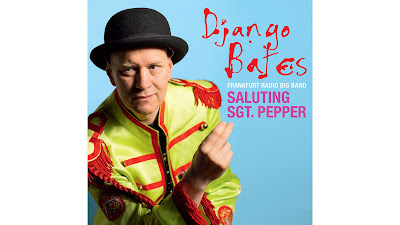 For this album Django Bates has chosen to ‘salute’ Sgt. Pepper in a very respectful way, adding his undoubted talents around the edges of one of the 20th century’s musical masterpieces to produce a subtle and enjoyable piece of work. How this translates as an exercise in ‘freedom, not licence’ is not entirely clear – perhaps the ‘freedom’ is that of the arranger to choose not to touch. Personally, I wish that, rather than paying a respectful salute, Bates had taken Sgt. Pepper out for a beer or two and seen how they’d got on while hanging out. You can see how this work fairs in a live context as the entire show is coming to Ronnie Scott’s for a week in September, followed by gigs around Europe.